English National Ballet's recent and traditional-looking performances of Le Corsaire played in theatres around the country just a few months ago and I attended a performance at the Bristol Hippodrome. The enthusiastic capacity audience clearly had a whale of a time acquainting or reacquainting themselves with the comparatively rarely staged ballet that evening. Their very positive reaction was shared by both other audiences and professional critics during the national tour. I only hope that someone had the foresight to arrange for it to have been filmed for later release. 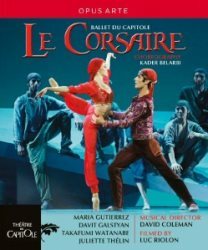 Now, though, we have a new DVD that its own advertising copy promotes as "a version of Le Corsaire for the modern age", implying, pace the ENB production, that 21st century audiences find might older-style productions somewhat dated. Acting on that premise, the Théâtre National du Capitole's Director of Ballet, Kader Belarbi has attempted to make Le Corsaire more suitable for "the modern age" by simplifying both the plot and the settings and by modifying the score. Does the ballet need changes, however, in those three areas? It's true, to be fair, that its plot is certainly not the easiest to follow. In fact, one earlier DVD release of an American Ballet Theatre performance (Arthaus Musik 100 066) addressed that issue head-on by including filmed interviews with audience members who, while admitting bafflement at the twists and turns of the story, suggested that it really didn't matter much because the spectacular production, inventive choreography and superb performances more than made up for it. Both the ABT and ENB performances are characterised by traditional "Ali Baba"-type sets and costumes. So too is a splendid Kirov (now Mariinsky) Ballet performance from 1989 that is memorialised on a Warner Music Vision/NVC Arts DVD (9031-71483-2). Kader Belarbi and his Toulouse team presumably believe that "modern age" audiences might be alienated by visual fussiness and politically incorrect artistic clichés, and have therefore opted instead for a cleaner, more modern and sophisticated visual style. As M. Belarbi himself puts it in the booklet notes: "I believe in renewing tradition by prioritising simplicity and authenticity over the desire for originality ... It's all about giving a work resonance and meaning today ..."
Finally, the decision has been taken to revise the existing score and even to interpolate some new music into the ballet. To be fair, the usually-encountered Le Corsaire score is already something of a mish-mash. The "standard" 19th century version was by Adam, to which, over the years, supplementary material by Pugni, Delibes, Drigo and Prince Oldenbourg was added, bit by bit. Even more music – by Chopin, Dvorák, Glière, Goldmark, Grieg and Tchaikovsky - was bolted on at Moscow's Bolshoi Theatre in the early part of the 20th century. Leningrad's Kirov company eventually discarded Adam's original score altogether in favour of music from some of his other works. The idea of anything like an urtext of Le Corsaire is, under those circumstances, pretty nebulous. So how does all this plot/settings/musical alteration stack up in practice in this production? In the first place, I have to say that I've never been convinced by the claim that Le Corsaire's old storyline was too confusing. There's certainly nothing there that a well-crafted programme note couldn't clarify for even the dimmest bon-bon-munching matinée audience. In any case, since when were plausible plots essential to ballet, where, just as in opera, narrative inconsistencies, implausible characterisations, emotional non-sequiturs and downright incoherence never spoil a good performance? That having been said, M. Belarbi's revised plot does make it possible to follow what's going on very easily, even if you're too mean - or, these days, possibly too poor - to buy a programme. The old, somewhat rambling and repetitious story has been replaced by a very straightforward, linear one: the dashing corsair meets and falls in love with the sultan's newest and most beautiful slave - he tries to free her from the harem but they are captured. She engineers his escape from gaol. They flee to the corsairs' lair but are pursued and defeated by the sultan and his troops. Alone and abandoned to the elements, they face the challenge of a fierce tempest, leaving their ultimate fate in the balance. Such a direct narrative means that some of Le Corsaire's better known episodes including the opening shipwreck and, even more so, the celebrated and gorgeous Le jardin animé dream sequence are no longer included. Various characters are significantly altered too. Those familiar with the "traditional" version of the story will be disappointed to find that the corsair's slave Ali - a flashy role requiring a dancer of the highest ability - is completely absent. True enough, the hero does have a male sidekick, but he is completely absent for much of the story. Moreover, even when he does reappear he is quickly tortured into revealing the whereabouts of the corsairs’ lair, which I'm sure that brave little Ali would certainly never have done. A new character, meanwhile, has been added to the exotic mix in the form of the sultan's favourite concubine. Jealous, duplicitous and sadistic - and exhibiting a somewhat idiosyncratic taste in headgear - she propels the storyline along by her scheming. She does this even though it is not always clear whether she is trying to help our hero and heroine escape, so as to have the sultan exclusively to herself, or to kill them. Another character whose role has been altered significantly is the sultan himself. More usually portrayed as a bumbling buffoon who wouldn't be able to overcome a marshmallow, he is reinvented here as a frighteningly violent man who overcomes our hero in single combat not just once, but twice. His treatment of the heroine is little better: a thoughtless practitioner of the supposed Australian mode of romantic foreplay ("Brace yourself, Sheila! "), he quickly has his wicked way with the slave girl and, in a very 21st century twist for M. Belarbi’s “modern age” audience, he even manages to escape any sort of retribution by the time the final curtain falls. Changes to traditional stage settings and costumes will also surprise some viewers. Sylvie Olivé’s sets – beautifully lit - are kept simple and uncluttered throughout, with no attempt at fussy realism. Everything relies instead on a few relatively abstract structures including a cloth canopy over the opening scene's "slave market" and light constructions of gauze and wire that suggest walls and arches and are tilted at different angles to suggest changes of location. There’s also an odd, pleated silver structure at the rear of the stage that forms a private area for the harem girls to change their clothes. Add to this a giant white "pebble" at the front, serving from time to time as a sofa; and a couple of large grey rocks that form the corsairs' lair - ideal for sitting atop or hiding beneath, according to the needs of the story. The costumes, by Olivier Bériot, have also been cleverly designed. Those worn by the ruling class - the sultan and the slave trader - veer towards "realism", if only of the "1001 nights" variety. Some others, such as the favourite concubine's aforementioned hat or some bizarre wire head-coverings that resemble nothing so much as medieval scolds' bridles, are altogether more fantastical. The lower down the social scale - and the cast list - that characters are located, the more "realistic" their costumes become. Thus, the harem girls' costumes are more functional and less transparently revealing than prurient 19th century audiences would have expected. Similarly, the corsairs are, for once, taken out of generically "exotic" costumes and put into dull-coloured, plain, functional and rather grubby clothing that, along with their eventual craven surrender to the sultan's forces, suggests that this lot may not necessarily be the Mediterranean's most successful freebooters. Moving on to the changes to the score, this production utilises Adam's original music - sometimes unaltered but on other occasions with modified orchestration – along with quite substantial new additions from Massenet's Hérodiade, Le Cid and Thaïs (though not the ubiquitous Meditation), Arensky's charming if lightweight ballet Egyptian nights, Sibelius's Belshazzar's feast and other music by Lalo and by the conductor David Coleman himself. On the whole, these changes work well. The scoring - generally lightened and made more transparent - only comes unstuck, to my ears, when something a little more brashly melodramatic might have been better suited to the on-stage action. The scene early in Act II when the sultan viciously rejects his concubine's advances was one such point, and the final battle/duel episode another. The "new" music fits in very well too in general, although some pieces do draw attention to themselves by their dissimilarity to the rest. Sibelius’s music for the "tambourine dance" is one example and the succeeding "sailors' dance" by David Coleman makes one sit up with a jolt - if not join in - when it suddenly introduces an unexpected fugue. The striking novelty of the production ought not to distract one from the uniformly successful performances being given on-stage. Davit Galstyan and Maria Gutierrez deliver convincing and technically very accomplished performances in the leading roles. Their dancing may not be on the grand, heroic scale of Yevgeny Neff and Altynai Asylmuratova in the 1989 Kirov recording, but they slot very well into what is clearly a company production rather than a flashy vehicle for superstars. I was also impressed by Takafumi Watanabe's performance as a convincingly villainous sultan, and, when offered the opportunity, he emerges as a characterful dancer too. The smaller roles are all well taken and the corps de ballet is well and imaginatively utilised, whether as townsfolk, harem girls, palace guards or pirates of both sexes. The Orchestre National du Capitole plays idiomatically and with verve under the very experienced baton of David Coleman, a conductor who is invariably alert to the practical needs of the dancers on-stage. A particularly positive impression is also made by Luc Riolon's direction for the screen. He clearly makes a great effort to keep the all-important dancers' feet clearly in shot whenever possible, even if that means eschewing some of the facial close-ups and medium shots that tend to be favoured in filmed ballet these days. His work is reproduced perfectly throughout the disc by a Blu-Ray picture of demonstration quality, with no hint of juddering at all during panning shots that track the dancers laterally across the stage. The sound is equally fine. A useful booklet contains interesting interviews with both Kader Belarbi and David Coleman, as well as a plot synopsis and a number-by-number breakdown of the score. The packaging wrongly suggests, by the way, that the performance's overall length is 100:00: it is, in fact, 110:00, even without the curtain-calls - where, incidentally, we finally encounter the talented M. Belarbi, looking, in his natty striped sailor’s vest, as if he's arrived straight from a photoshoot with photographers Pierre et Gilles. This is, altogether, a most interesting and a hugely enjoyable disc. Dyed-in-the-wool traditionalists should certainly not ignore it. I admit that, on first viewing and still in thrall to that recent live ENB performance, I regretted the loss of the traditional elements of exotica. On coming back for a second look – and prepared this time for what to expect - I found that I appreciated it much, much more. I would still want to have the "old-fashioned" Kirov version on my shelves, but the considerable artistic achievement recorded on this new disc and its superb technical standards easily win it a place too. Indeed, for anyone whose main priority is to have a "Le Corsaire for the modern age” – and anyone wanting to watch expertly and beautifully filmed performances by a very accomplished company of dancers - this innovative account from Toulouse could hardly be bettered.